Hooray! 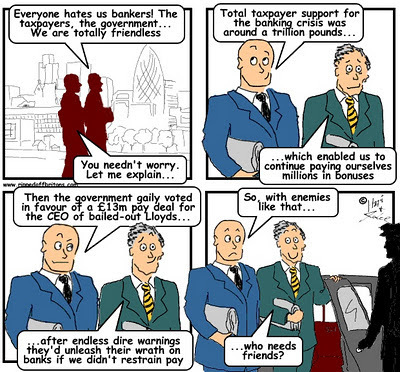 We the bankers of Britain will soon be getting our richly deserved Christmas Bonuses! You ripped-off Britons should be grateful. Without our bonuses, we would have already abandoned you and emigrated to Switzerland to flash our cash in the milk bars, get drizzled with premium chocolate, and ski. Competitor banks are always waving their wads under our noses. We’re not greedy. If we were greedy, we’d have gone already. Of course every silver lining has a cloud. The biggest problem with the bonus is how to spend it. A new Porsche? Mega-flat, school fees, credit card bill, something shiny from Tiffany's? And if some slackers don’t get a bonus, at least there is a free cup of coffee and some drama too (see later). Much has been written about the bonus culture and the excesses of the banking system. How is it that in these austere times banks are making so much profit they can pay huge bonuses again? Without doubt being a banker can be one of the most lucrative jobs going. Not only is there a healthy salary, lots of fringe benefits, but also the motivation of the juicy bonus. There are long hours and lots of stress, but there’s also a nice air conditioned office and a subsidised canteen. Not really a hardship spending long hours in this environment. Many bankers are there for the intellectual stimulation, but really most are not there for charitable reasons or to make the world a better place – it’s all about profit. Pay in the fancy lingo of Human Resources is known as compensation. This starts to give an insight into the motivation of workers in general and bankers in particular. Compensation in this context is payment for the bankers’ skills and time. The fixed element of a banker’s pay is the salary and the bonus is the variable part. The salary is the agreed rate for the job. This is driven allegedly by ‘market conditions’, but it’s really about how much the banker has been able to negotiate, or in reality how much the headhunter has over sold the banker in order to increase their fee (typically up to 40% of the salary). Even better if they have negotiated a ‘guaranteed’ bonus. This means that a banker will be paid a bonus regardless of performance - nice work if you can get it! Guarantees are used as sweeteners to aid the pain of moving from one bank to another. The reality is you may have to give up your bonus at one bank when you leave, so it’s a bribe really. Signing bonuses are another nice wheeze - new job, fancy title, a big pile of cash upfront. You don’t even need to perform for a couple of years by which time you will be ready for another move anyway! Wow, Christmas has come early! Just as Santa is hard at work in the workshop with the elves making toys and deciding who gets them, the banks’ bonus committees are doing the same thing. Typically the bonus committee is made up of senior bankers and departmental heads with input from HR, compliance, legal etc. It’s actually a totally pointless exercise as it will have been decided who is getting a good bonus and who isn’t. The point of all the hangers-on at this bloated meeting is firstly ‘inclusion’ - makes people feel important - and secondly to ensure that there is the appearance of a rigorous process in place. This appearance of process is actually important. If it can’t be shown that there is rigor, the bank is leaving itself open to claims of discrimination. In fact most banks have now put some weasel words into their employment contracts about bonuses being discretionary. They also go to great lengths to emphasis the rigor of the process, but also to make it as opaque as possible. They go even further by prohibiting staff from discussing bonuses and making doing so a sackable offence. · Do we want to retain them? · Have they made us money? These two things decide your bonus. If you’ve had a huge year but they want to get rid of you, you will get a ‘price signal’ by a small or zero bonus and thence a free cup of coffee at your ‘exit interview’. Alternately if they want to retain you, you may get a better bonus that you expected. All the other criteria, rankings, scoring systems are just smoke and mirrors and people justifying their jobs. So what has your average banker done to earn a bonus? To paraphrase a well known economic dictum ‘profit is just reward for risk taken’. The average banker has taken no risk. What’s the worst that can happen to them? Get fired? Maybe at the very extreme, end up in prison? Bank bosses have proven themselves very adept at avoiding blame and responsibility as they say in the USA when a settlement is made the bank in question neither “admit nor deny doing anything wrong”, though a US judge has recently censured Citigroup and SEC for a cosy settlement like this. Robert Khuzami, the director of enforcement at the SEC, complained about the judge's comments, saying the judge ignored "decades of established practice throughout federal agencies and decisions of the federal courts". Most unreasonable, I think you will agree! Even when a bank is sunk it is bailed out by the taxpayer. On this measure most bankers who take no personal risk don’t deserve a bonus. Also given the recent crisis in the Eurozone it’s been suggested that bankers forgo bonuses this year in order to shore up their balance sheet for the forthcoming storm. Of course just as a parasite ultimately destroys its host, the avaricious banker would rather have their bonus now, hang the bank, hang the economy, and hang the consequences. Bankers, as they eye their Christmas list will argue that they may have made money for the bank, but they have made nothing of value. Trading exotic derivatives doesn’t add value, it creates risk. Making a loan to a small business enables the company to create value. But is no more wealth creating in itself that the supply of other utilities such as electricity or water. Bankers will bleat about being competitive. HSBC one year paid no bonuses and they are still doing rather well (and no doubt will still be paying bonuses despite the recent Pensioner rip-off scandal - happy Christmas Grandma!). This is the crux of the problem. Bonuses in the finance world have become a right. They are not a right, they are exactly what they say they are - a bonus. The problem is the culture of excess, greed and entitlement that runs deep through the veins of our bankers. What happens when people don't get the bonus they expect? Well the whole spectrum of reactions from silence, through to anger, even violence (mainly to inanimate objects: table been turned over, drink spilled). Most often it's harsh words and then sharpen up the CV followed by a stiff drink and more swearing! Occasionally people raise a formal grievance with the process (which can never be won, as the bank sits at judge and jury), which is really just a precursor to resigning. With the current atmosphere in the city, people are likely just to be grateful to have a job going forward. We know of quite a few bankers who are 'on notice' of redundancy and they are just trying to get through each day/week. When people are being given the bonus or being fired news, they are often given a discreet tap on the shoulder, or a call and asked to come to a room. Everybody knows what's happening and it leads to a hideous atmosphere - real 'night of the long knives' stuff. We have seen people come out of the 'bonus' meeting and shout obscenities across the floor. This will probably only happen when the market is buoyant and they have another job lined up, as you are going to get fired for it. Banks of course take precautions against vengeful mischief. There may be a security guard close by, an HR person to hand you tissues or even a referral to an employee helpline if you are seen as being at risk of self-harm. The bank just wants minimum fuss and to protect its position. To avoid any drama you will be gone before you know it. When that happens people are literally either frog marched out of the building by burly security guards, or if there is a lower risk, they will be escorted discretely back to their desk to clear personal items and then shown the door. I've sat on a trading floor and watched people being picked off around me - most not coming back. It's awful and intimidating - exactly what the bank wants as they want compliance and submission - you are just there to make money. Don't think or have emotions for goodness sake! But hell, we don’t look for sympathy, just for someone else to pay us a bonus. Assuming it's good news, i.e. you have a job and/or a bonus, you will be told sternly about not discussing it with anyone. Headhunters usually have the best knowledge of what's actually been paid as they benefit from the fall out. All the paperwork will be ready, so you can be got rid of quickly. Most banks have surveillance systems which can extend not only to monitoring your email and calls, but listening to desk conversations (usually covertly by CCTV in the ceiling). It's really like East Germany under the Stasi! Bob Diamond summarised this attitude very well this year to the House of Commons Finance Select Committee when he said: “the biggest issue is how do we put the blame game behind us? There was a period of remorse and apology for banks – that period needs to be over”. Enough saying sorry, time to move on, time to take a bonus. It’s hardly the Christmas spirit is it? Happy Christmas Bob. Happy Christmas Bankers. Hooray, it’s bonus time again! This looks absolutely perfect. All these tinny details are made with lot of background information and inspiration, both of which we all need, thanks for providing such helpful information here.